The Boxee Box -- that sucker had a ton of hype behind it, but things don't always work out. After two years of fighting Roku, Apple TV and, to a lesser extent, Google TV for market share, Boxee has drastically rethought its approach. 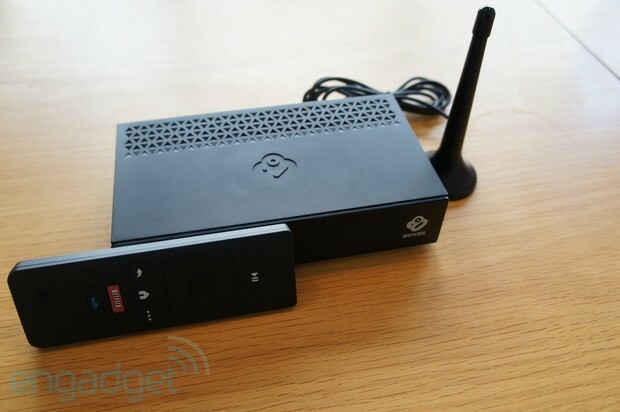 The $99 Boxee TV marks a new chapter for the company with a focus on live TV and a streamlined consumer experience. Baked right inside the matte plastic case is a dual tuner capable of pulling in unencrypted basic cable channels and over-the-air HD broadcasts. There's a slick guide to help you navigate but, most importantly, the slimmed down software sports DVR functionality. The Boxee TV has no internal storage, however, instead all your recordings are stored online in a "No Limits" DVR. For $15 a month you'll be able to save as many shows as you want and watch it on your TV or on your computer, tablet or phone through an HTML5 webapp. The DVR service will be rolled out to New York City, Los Angeles, Chicago, Dallas, Houston, Atlanta, Philadelphia and Washington DC to start, with other markets set to come online in 2013. The selection of apps is not quite as robust as it is on the legacy Boxee Box, but CEO Avner Ronen has settled on a quality over quantity approach. Netflix, VUDU, Pandora, YouTube and Vimeo will come preinstalled on the Boxee TV and other apps will follow. But we wouldn't expect to see Know Your Meme or PornHub on there anytime soon. Some of the other losses are a little harder to swallow for fans of the original hardware. The move from Intel to a Broadcom SOC means the streaming options for locally stored media are much less robust. There's DLNA support, but many other networking protocols have fallen by the wayside. The beloved QWERTY remote has also bitten the dust, replaced with a much simpler device that sports dedicated Netflix and Vudu buttons. Even the distinctive "sinking cube" design has been replaced with a basic rectangle that's barely distinguishable from other settop boxes. You can sign up for more info at the Boxee site where you'll also be able to preorder the Boxee TV ahead of its November 1st launch. Boxee TV delivers dual-tuners and cloud-based DVR for $99 November 1st originally appeared on Engadget on Tue, 16 Oct 2012 10:00:00 EDT. Please see our terms for use of feeds.